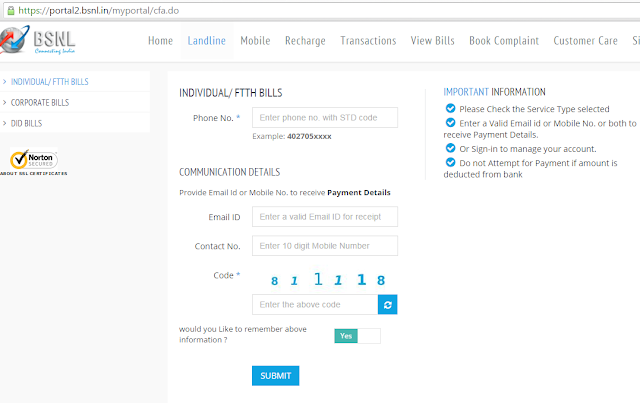 To view or download the BSNL cellone duplicate bill, you have to first sign in to the BSNL online portal. Go to the link https://portal2.bsnl.in/myportal/authorize.do, then sign in with your user name and password. 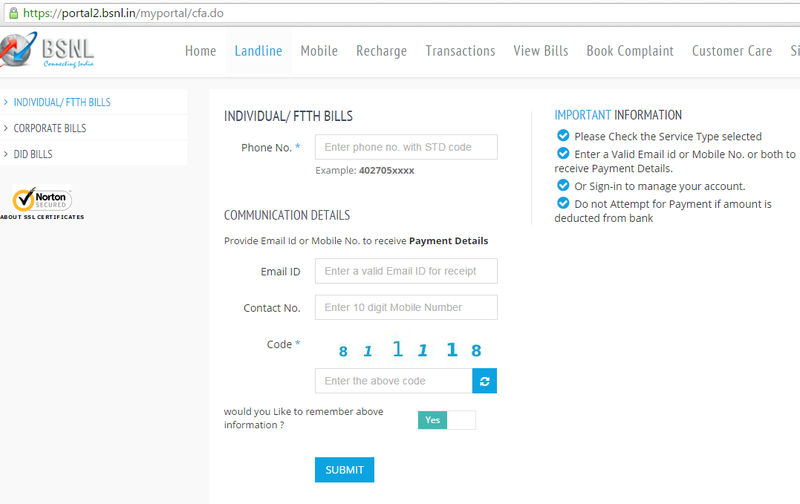 Once you signed in, click on the 'View Bills' tab to view the Cellone duplicate bill easily. If you have not signed up in Cellone yet, you have to first sign up with your details. By signing in to BSNL with your id and password, you can have the following facilities. You can view a feature Rich Dashboard. You can manage Accounts from a single login. You can do One click Payment. You can get Duplicate Bills online. You can also login to the BSNL portal with facebook, linkedin, google plus and even Microsoft hotmail. The customers should click the sign in button that is available in the upper right corner of this webpage. If the customer is the new user then they need to click the Don’t have an account yet button in order to register in this BSNL website. The user will be redirected to the following page where the user has to provide the requested details like name, email id, mobile number, OTP sent for verification, circle, selected password and the user should enter the code that is being displayed. Then the user should click the create an account button in order to create an account in this web portal. The user needs to sign in using the details that are given during the registration. The users can also reset the password if they need using the options available on the left side of this page. Once the account is created the users can sign in by entering the email id or mobile number or old username and the selected password then the user should click the sign in button in order to access the services of this website. If the user forgets the password they can reset It by clicking the forgot password button where you will be redirected to another requesting for the email id and the user needs to enter the code that is being entered and finally they should click the submit button in order to reset the password. Corporate bills can also be viewed by entering the account number, state, email id, contact number and the code that is being displayed. The user has to click the submit button to get the corporate bills. DID bills can also be fetched by entering the account number, state, email id, contact number and the code that is being displayed. The user has to click the submit button to get the DID bills. The user can fetch the GSM bills under mobile tab by entering the mobile number for which the bill payment is required, account number, email id, contact number and the code that is being displayed. The user has to click the submit button to get the GSM bills. The user can fetch the Wi-Max bills by entering the Wi-Max user ID, account number, email id, contact number and the code that is being displayed. The user need to click the submit button to get the Wi-Max bills. In order to fetch the CDMA/NIC/EVDO bills the user need to provide the service number, account number, email id, contact number and the code that is being displayed. The user should finally click the submit button to get this duplicate bills. Prepaid recharge options are available under recharge tab where the users can view the prepaid options for GSM, broadband, landline and CDMA. Bharat Sanchar Nigam Limited popularly known as BSNL is a public sector company providing telecom services to its customers. Communication has become the vital part in the today’s busy world and hence many ways for communication has been found out. Telecom services provide best way of communication in order to share the information to one another via telephones. People can communicate using either landline or mobile phones. This company is a government undertaken company which is one of the largest and leading public sector unit providing telecom and network management services from central government department of telecom services and telecom operations. This company has a web portal where the customers can opt for the desired mobile options and know the tariffs and offers associated with the telecom services. The customers can recharge or pay the bills using this web portal. They can also view their bill or latest transactions that are being done. The customers need to first register in order to access the services that are available in this website. The user should use the below link in order to access the services of BSNL website. Hope the article Cellone Duplicate bill - BSNL Cellone duplicate bill is helpful for you to view and download the Cellone duplicate bill easily.